What is the requirement to make heaven? What is the mistake that would cause one to end up in hell? What part of the old testament should we still practice? What are we to do about the books of the old testament? How are we to practice true new testament Christianity? Should we still pay tithe? What are we supposed to do concerning tithing? What about pastors, prophets and other clergy? How should the Christian church be govern? What is the rules of the New Covenant? Even more, the book gives you a peek into the Father's heart, to know Him, His passion and desires. You would stop being so fearful and know how to make God happy with you and what exactly offends Him. This book would not only give you a unique understanding of the Christianity, it would also transform your relationship with God. The New Covenant is God's masterpiece; the fulfillment of a plan He conceived in eternity past. Unfortunately, we've misunderstood it in many ways; we have not practiced it the way He wants. We've not fully comprehended the dividing line between the old and new covenant. In many ways, we keep mixing them together, resulting to an impure application of the New Covenant. If only, the New Covenant is practiced in it purity it would produce a glory that would overshadow all the miracles in the Old Testament. In this book you would learn to practice the New Covenant the way God designed it for our glory. Through civilization, man has lost the meaning of blood covenant. This book unveils what it means to be in a blood covenant — the solemnity of the ritual. This book also reveals God pursuit; as He moves from one covenant to another until he reached His final destination — the New Covenant. For decades, Christians have tried to understand the relationship between the Old and the New Covenant. The lack of this understanding has caused us to mix the practices of the Old Covenant with the New. The New Testament didn't provide us with detailed information about the New Covenant. However, with the approach used by Paul in the book of Hebrews, this book attempts to produce detailed information about the constituents of the New Covenant. 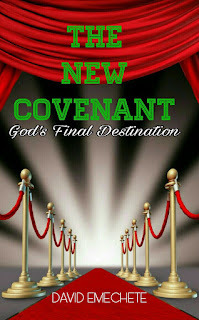 It reveals the nature of the New Covenant and how it is the fulfillment of the Old Covenant. This book provides an elaborate explanation of the pillars of the covenant, which are: the Priest, Prophet and King. The book reveals what it means to be a priest in the New Covenant. It also teaches about the prophetic in the New Covenant. Then it went on to give details of leadership according to the teachings of Christ. Lastly, it speaks of a coming move of God — yes, a revolution! Okadabooks; if you are in a country in Africa.